The South Huron Chamber of Commerce in partnership with 90.5 myFM and Metzger Meats are hosting a new event. HURON EATS & DRINKS! To date – February 2019, we have over 30 food and drink vendors registered to share their products and more are signing up daily. This event will be one of the best new events of the year. 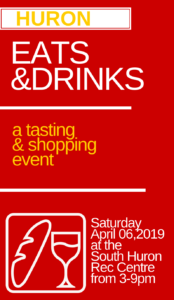 Lots to see, do and taste! Grab a group of friends and make it a night out or bring your partner to share the fun and flavours! Save $5/ticket if you purchase them online at EVENTBRITE and the local businesses listed below. Each ticket comes with 16 tasting vouchers and samples will vary from 2 to 4 tickets each. More vouchers can be purchased at the event. Advance tickets are $25/person (+HST) and $40/couple (+HST). Tickets will be $30/person (+HST) and $50/couple (+HST) at the door. The South Huron Welcome Centre: 483 Main St., S., Exeter, Ont. 90.5 MyFm:14 Thames Rd. W., Unit 6, Exeter, Ont. HD Co-op Gas Bar: 51 Main St., N., Exeter, Ont. Metzger Meats: 180 Brock Ave, Hensall, Ont. Bad Apple Brewing Company, 73463 ON-21, Zurich, Ont. This new event will become an annual festival of food, drink and fun. 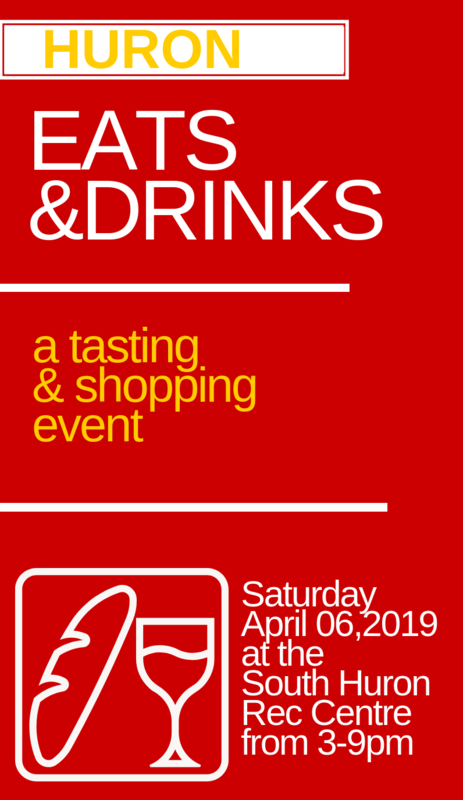 Showcasing all things local, this ticketed event will feature a shopping concourse, tasting opportunities of both food and drink. Attendees will be glad to discover the newest trends in cooking equipment, kitchen upgrades and popular new recipes. VENDORS: Check out our Vendor Packet. There is room for everyone. Next Post:Ontario Chamber of Commerce provides a “Blueprint for making Ontario open for business”!